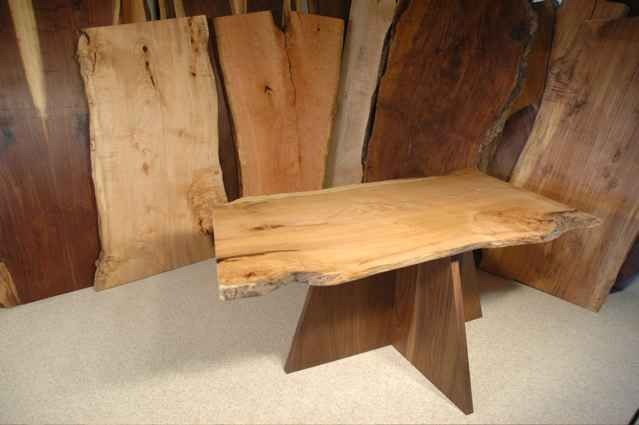 Large Custom Handmade Dining Tables with Natural Edges and Organic Shapes. Dumond’s large rustic, contemporary, and modern handmade dining tables are crafted from Walnut, Cherry, Bubinga, Maple, Oak and other unusual woods. These are unique, unusual, artistic, one of a kind, rustic handmade dining tables custom made to order!!! Natural Edge Maple Slab Dining Table. Natural Edge Curly Maple Slab Custom Dining Table with Walnut Pedestal Base. Approximately 65″ long x 35″ wide. 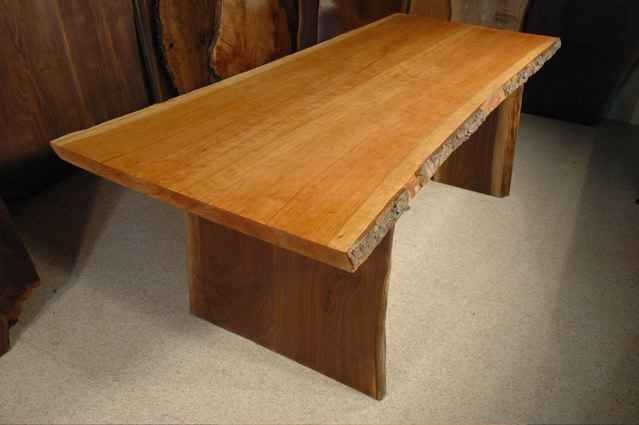 Organic Custom Curly Cherry Crotch Slab Custom Dining Table. 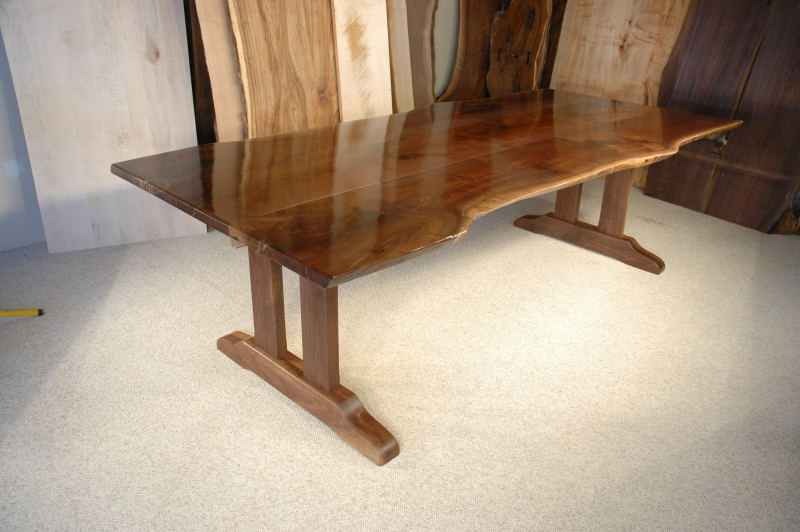 Organic Custom Curly Cherry Crotch Slab Custom Dining Table with Walnut Pedestal Base. Approximately 8′ long x 58″ wide. Available For Sale Now! Quilted Maple Custom Dining Table. Irregular Natural Edge Walnut Slab Custom Dining Table with Walnut Slab Base. Approximately 9′ long x 32/36″ wide. Ash Slab Dining Table With Double Walnut Pedestal Base. 8′ Ash Custom Slab Dining Table With Double Walnut Pedestal Base. Available For Sale Now! The Burns Rustic Walnut Slab Trestle Dining Table. The “Burns” Rustic Walnut Slab Trestle Custom Dining Table- Approximately 9′ x 40/48″ wide. The Paparo Custom Rustic Walnut Slab Conference Table. The King Custom Walnut Slab Dining Table Version 1. 8.5′ x 46″ Wide Walnut Slab Custom Dining Table. Available For Sale Now! The King Custom Walnut Slab Dining Table Version 2. The King Custom Walnut Slab Dining Table Version 3. The King Custom Walnut Slab Dining Table Version 4. Rustic Kitchen Island with Walnut Slab top. Organic shaped Custom rustic kitchen islands made to order in Montana by Dumonds Custom Furniture. Rustic Kitchen Island with Walnut Slab top, curly maple base and brushed nickel drawer pulls. Size 29 / 39″ W X 36″ X 7′ L.
Cherry drop leaf handmade dining table. Custom rustic handmade dining tables and kitchen tables made to order by Dumonds Custom Furniture. Cherry drop leaf custom dining table. Size 41″ L X 18″ W X 30″ H closed. 96″ L X 41″ W X 30″ H open. Wide book matched maple dining table. Wide book matched maple custom dining table. Size 42″ W X 30″ H X 11′ L. SOLD but I could build another similar table with a Siberian elm top. Recycled book matched maple crotch handmade dining table. Organic natural edge Custom rustic handmade dining tables made to order by Dumonds Custom Furniture. Recycled book matched maple crotch custom handmade dining table with inlaid ebony butterfly. This unusual custom table has a rustic feel. Size 29/39″ W x 30″ H x approximately 84″ L.
Rustic Custom Claro Walnut Burl Slab Dining Table. Rustic Custom Claro Walnut Burl Slab Dining Table with natural organic edges. With Pedestal Base. Size 47″ W x 30″ H x 49″ L.
Organic Rustic Custom Hour Glass Shaped Claro. Organic Rustic Custom Hour Glass Shaped Claro Rustic Walnut Slab Custom Dining Table. The Martins 5′ custom conference table with natural edges. Custom Rustic English walnut conference tables made to order by Dumonds Custom Furniture. The Martins 5′ custom conference table with natural edges. Size 30″ H x 60″ W x 60″ L.
Bookmarked Claro Walnut Dining Table with Walnut Slab Base. This elegant walnut dining table has a beautiful grain that you will appreciate every time you sit at this wonderful table. Rustic Claro Walnut Slab Custom Dining Table. Size 48″ W X 48″ L X 30″ H. AVAILABLE FOR SALE NOW!! CALL FOR PRICING. Sycamore and Walnut custom slab handmade dining table. Rustic quarter sawn sycamore and walnut custom slab custom dining table. Sycamore and Walnut custom slab dining table with natural edges and trestle base. Size 42″ W x 30″ H x 42″ L. AVAILABLE FOR SALE NOW!! CALL FOR PRICING. Book matched Slab Walnut Custom Dining Table. Book matched Slab Walnut Custom Dining Table. One of a kind book matched slab custom rustic walnut dining table with walnut pedestal base 42W x 60L x 30H. Place your order today, only one available. Ash custom country handmade dining table. Rustic Recycled Ash Country Slab Custom Handmade Dining Table with benches. Size 60″ L x 26″ W x 28″ H.
This 10 foot natural edge organic custom dining table is supported by two salvaged steel i-beams. The live edged maple slab dining table has two ebony butterflies. 10′ Maple Burl Custom Dining Table with natural edges and Salvaged Steel Base. Natural edge curly maple burl with salvaged steel base from our local steel recycling center. Reclaimed Old Wood Dining Room Table. Spalted maple Dining Table with Cherry & Maple legs. 102″ long x 45/49″ x 1.5″ thick spalted maple table with cherry and curly maple legs. Red Oak drop leaf custom handmade dining table. Rustic Natural bug holed, quarter sawn, red oak drop leaf custom handmade dining table. Size 41″ L X 41″ W X 30″ H closed. 96″ L X 41″ W X 30″ H open. Cherry Slab Custom Rustic Handmade Dining Table With Butterfly Accents. Custom rustic handmade dining tables made to order by Dumonds Custom Furniture. Greybill Cherry Slab Custom Rustic Dining Table w/Butterfly Accents. Penthouse Walnut Slab Dining Table. Penthouse Walnut Slab Custom Dining Table. New York City Penthouse apartment custom designed by Diane Paparo Associates.